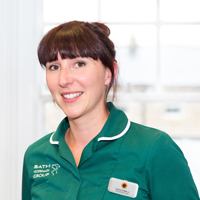 Laura joined Bath Vet Group in 2005 as a trainee and qualified in 2007. She moved to Rosemary Lodge Hospital when it opened. After taking some time off to travel in Thailand and Australia she returned to the group as Head Referral Nurse. Outside of work she is kept busy looking after her young son and playing netball. She has three cats.